If you have that sweet NRI uncle who promised to get your US-makeup stuff, or that irritating aunt who gave you a nod to ship few items to her US address, you might want to head over to Sephora.com for the ultimate US makeup shopping. Lets be real, there are very few International makeup brands that sell their products in India and a whole lot less who sell it at the actual rate. Most of the items, the items are priced at 2000-3000 rps more that the price*FX rates. I haven't shopped at Sephora India yet, but I have had my cousin say that they are very few brands available in the Sephora store. 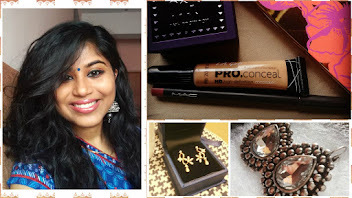 NARS, Anastasia, Urban Decay, Too Faced and so many more are yet to make their way onto the isles here in India. If you can, get your items shipped to your relative's place and request them to bring the stuff along to India. I am very lucky wrt the shipping part. My husband's cousins split their time in India and US, 3-4 month's each. So, I always get my items in 2-3 month's time. Payment through an international Credit Card: I faced issues with card authorization when the orders were valued above 100 dollars. Both the times, the orders got cancelled. I had to order in chunks (3 chunks), with each order value less than 100 dollars. The exchange rate are always high, ie, on the transaction day, the FX rate was 62.3, CITI charged me 64.2 for the transaction. FYI: I used CITI bank credit card. For every 15 dollar you spend, you will have to give about a dollar as tax. The tax will be added to the final payable amount. You will not be immediately charged by Sephora for the purchase. Only when the item is shipped, you will see the entry in your credit card statement. Ensure you utilize your beauty insider points (subscribe to their newsletters) in exchange of good sized products. I utilized my 200 points in return of CLINIQUE Moisture Surge Extended Thirst Relief (0.21 oz) and Lancôme Advanced GÉNIFIQUE Youth Activating Concentrate (0.27 oz). Before confirming payment, check for any available offers. Click on View Current Promos link and it will display the running offers. I received a sample sized Benefit Hello foundation. 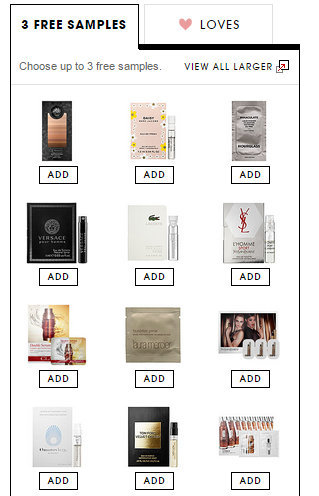 Apart from the above two, you can select three samples (perfume, makeup, or skin care) and add to your basket for no added cost when you shop for more that 25 dollars. Shipping is free above orders worth 50 dollars. Sephora has a good collection of Value Kits available from this link. If you are one of those people, who never go through the entire product, the value packs contain different travel sized products. In this way, you can try a different bunch of products. I got the Benefit Bronze Of Champions kit and Tarte Poppy Picnic LE palette. Sephora runs 10% discounts on their entire line once or twice a year. This is available only to their VIB Rouge customers (the ones who spends $1000 a year). If you are or plan to be one, then shop during this time. Their shipping (standard) is pretty quick and you can expect the package to arrive in 3-4 days based on the location. Apart from the standard shipping, they also have priority shipping which is costlier in comparison. Sephora customer desk is not so helpful in solving your queries. The first time I saw my order was cancelled, I mailed them asking why was there a confusion when the 2nd order was already shipped, I even got manual authorization code from my bank, all their customer care replied was in standard template. I figured out myself that if order was valued less than 100 dollars, it wouldn't get cancelled because of authorization issues. If you are looking for perfume, I would suggest trying their roller-ball versions. They are much cheaper, and you can try out a scent without having to commit to a bull sized bottle. Ulta is a cheaper alternate for drug store+high end makeup shopping. They stock brands like Maybelline and Lorac, and the only downside is, Ulta does not allow the billing address to be different from the shipping address. If you have an option, do check out Ulta first. You are literally god sent!!! I've been pouring over the internet for days now trying to figure out if I can ship to USA but pay from India. This post really helped. Thanks. What's the deal with Ulta? As for Ulta, the card billing address should the same as the shipping address. Try shopping from US websites that ship to international destinations (not necessarily to India), in which case international cards would be accepted.